This is the fourth in a series of posts highlighting cases of statelessness throughout the world. Click here for more information about the series. Already displaced from their native home in southern China, the Hmong people have drifted through various Southeast Asian countries for the past two centuries. Though they have met hostility in practically every country they have entered—including China, Thailand, and Vietnam, they have faced the most problems in Laos. Given their unique location in Laos, lack of ties to local or national governments, and general poverty, the United States found the Hmong living in Laos to be a useful ally in the struggle against communism. During the Vietnam War, the C.I.A. recruited and trained Hmong to disrupt the Ho Chi Minh Trail, a vital supply line running through Laos that linked communist North Vietnam to sympathetic Viet Cong in US-backed South Vietnam. Though this resulted in the death of approximately 100,000 Hmong men, the United States kept their involvement in Laos secret. This did not help the remaining Hmong. In 1975, just two years after the United States left Vietnam, Laos fell to a communist regime. Fully aware of the Hmong’s involvement in the Vietnam War and buoyed by the North Vietnamese, the new government retaliated against the Hmong. Fearful for their lives, many fled into neighboring Thailand, overwhelming United Nations refugee camps. 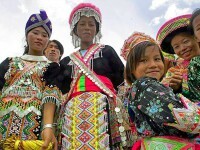 However, some Hmong remained in Laos. Of those, many died during their stay in “reeducation camps” sponsored by the government. Others escaped to mountain villages where today they are barely able to eek out a living. There, the Laos government constantly harasses them–people are randomly arrested, bribes are extorted, and villagers live in constant fear of raids. In the summer of 2011, I visited one of those villages during a brief visit to Laos after working on the Thai-Burma border. As one of many locations in a tourist package, the village was oddly out of place with the other stops that focused primarily on the scenery and natural beauty of Laos. Instead, the Hmong village was something more similar to a zoo. As my guide walked me and the other tourists through the village, it became clear that tourists were the sole source of income for these villagers—and this is the case in most of their villages. Though the Laos government stopped persecuting the Hmong in 2011 after the death of Vang Pao, the general who led the Hmong forces during the Vietnam war, the Hmong have not faced better treatment. Still discriminated against by indigenous Laotians and relegated to impoverished communities after decades of legal harassment, the Hmong in Laos are a displaced people with nowhere left to go. Though many have sought refuge in the United States, there is little hope that the Hmong will ever be a unified people again. For them, there is no hope of a state. This entry was posted in Conflicts and tagged hmong, laos, stateless people. Bookmark the permalink.